I.C. Engine or Mechanical Linkages. 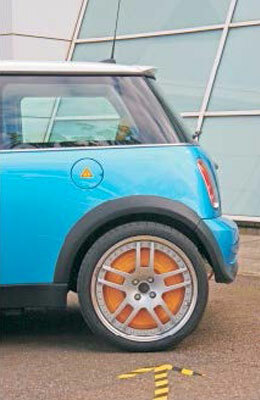 Instead of an engine, it has a fuel cell stack, which powers an electric motor connected to the wheels. Instead of mechanical and hydraulic linkages, it has a drive by wire system -- a computer actually operates the components that move the wheels, activate the brakes and so on, based on input from an electronic controller. This is the same control system employed in modern fighter jets as well as many commercial planes. 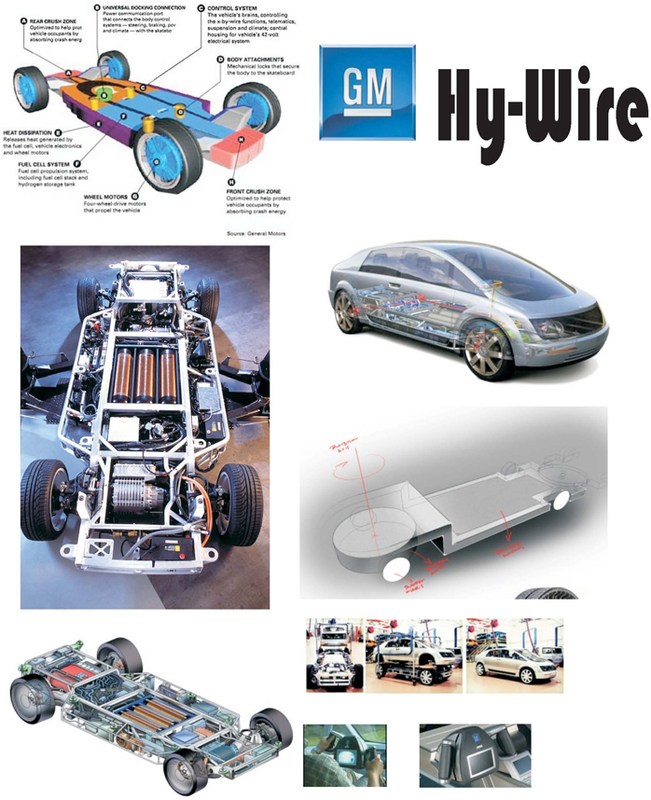 Due to hydrogen fuel cell drive system used by the Hy-wire, the conventional car layout has been revamped. Without the need for a conventional engine block and transmission system coupled to the steering column and pedals through mechanical linkage the car's power system and single electric motor are built into a flat skateboard configuration. This serves to lower the car's center of gravity but more importantly to standardize vehicle drive train systems. Because all propulsion and energy storage systems are housed in the skateboard, designers are free to arrange the passenger compartment however they see fit. This allows for highly flexible modular vehicle configurations such as a 4 door sedan, mini van, or even a small bus to be placed on the same drive system, with the only difference being the shape of the car's upper body and the location of seats. The skateboard itself contains crumple zones similar to those in conventional automobiles. The car's drive-by-wire system coupled with cameras instead of mirrors and multiple LCD displays for feedback to the driver theoretically allows the driver's seat to be located anywhere; however, most current designs still favor the driver in front of or beside the other passengers for maximum visibility. The digital coupling of the controls to the drive system means neither the driver's seat nor the steering and throttle controls must be fixed in place. For example, the 2003 concept model has a single control interface that can be operated from either the right or left front seats, and the 2004 concept design places the two front seats on a rotating platform which allows the driver and passenger seats to be swapped or the driver to sit in front of the passenger for greater flexibility. The Hy-wire is powered by a fuel cell capable of producing 94 kilowatts of power continuously and up to 129 kilowatts for short periods. The fuel cell itself is supplied with hydrogen from 3 tanks of compressed hydrogen located in the chassis. With its three-phase electric motor the 1,814 kg (4,000 lb) vehicle has a top speed of 160 km/h (100 mi/h). Hub motor electromagnetic fields are supplied to the stationary windings of the motor. The outer part of the motor follows, or tries to follow, those fields, turning the wheel to which it is attached. Energy is transferred to a brushed motor through physical contact of brushes to the rotating shaft of the motor. Energy is transferred to a brushless motor electronically, requiring no physical contact between stationary and moving parts. Although brushless motor technology is more expensive, most are more efficient and longer-lasting than brushed motor systems. A purported advantage of this design is that no additional transmission system is needed, thereby increasing the efficiency of the drive system.